Have you heard of the Bacon Explosion? 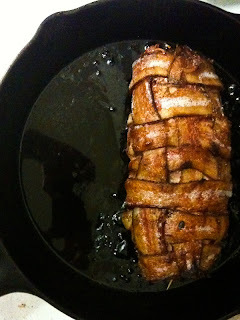 It’s cooked bacon and barbecue sauce, wrapped in a thick roll of sausage, then wrapped in another layer of (woven) bacon, and smoked until cooked. When the Burnt Fingers bbq sauce guys first wrote about it, it definitely captured people’s attention. Folks tended to either love the idea of it or think it was a disgusting example of excessive meat consumption. The guys who created it have had enough success that they’ve trademarked it. But when I came across a Primal version of the Bacon Explosion that incorporates a pork loin, that caught my interest for a possible dinner recipe. The catch is, I don’t usually find pastured pork loin. Pork loin is all over the place if you want to buy the crappy meat of mistreated, confined pigs, but pork loins of pigs that are raised as they were intended are more rare. However, I came across Niman Ranch pork loin in the co-op a few days ago, and while post-corporate-takeover Niman meat isn’t as ideal as buying from a family farm, it has decent standards. I bought the loin. I began daydreaming about my own dinner version of a Primal Pork Explosion. This one would retain sausage in the interior, but it would be blended into a sausage stuffing with naturally sweet ingredients so that sugar was unnecessary. 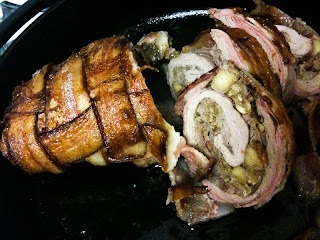 I looked at Jamie Oliver’s and Mark Bittman’s recipes for pork stuffing, and then I created a primal version of my own. 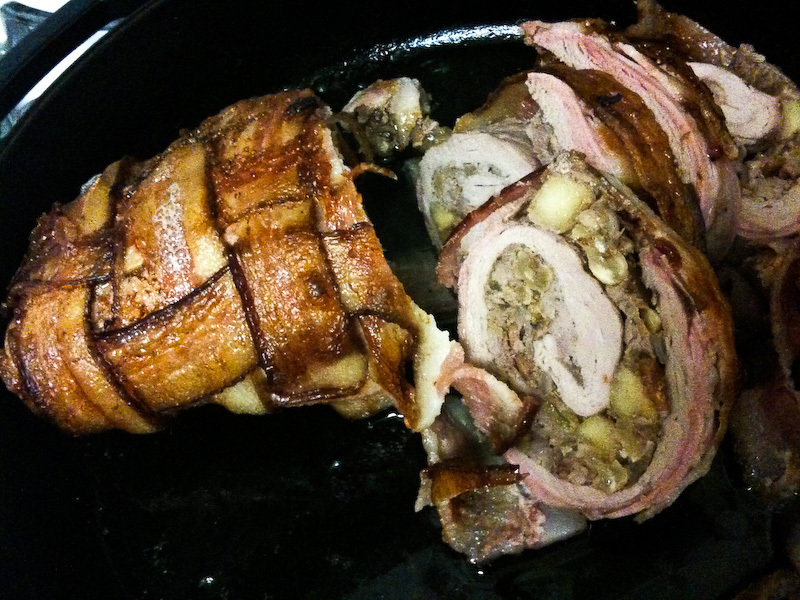 Voila: a beautiful roll of bacon and pork loin swirled with a sausage, fruit, and nut stuffing. Very savory and satisfying with hints of sweetness and some variation in texture. A lovely meal. Prepare your smoker. If you do not have a grill with smoking capabilities, preheat your oven to 350 degrees, and put your cast iron skillet in to heat with the oven. Cook three slices of bacon. Remove from pan. Cook the diced onion until it begins to soften, 3-4 minutes. Add the apple and fennel seeds; cook until soft, 4-5 minutes. Remove from heat; stir in the walnuts and raisins, and crumble in the cooked bacon. When cool, stir in the raw sausage until well-mixed. Set aside the sausage stuffing. Using a meat mallet, pound the pork loin to 1/2” thickness. Spread sausage stuffing in a layer on pork loin. Roll up tightly, pressing out any air pockets that might form. Smoke at 225 degrees, for about one hour per inch of thickness, or until interior hits 145 degrees. (Alternately, remove the very hot cast iron skillet from the oven. Put the roast in the skillet, and roast at 350 degrees, about 15 minutes per pound of total roll’s weight, until interior temperature reaches 145 degrees. If the bacon isn’t crispy to your liking, broil the Pork Explosion for 1-2 minutes, until bacon is crispier.) Allow to rest for five minutes; then slice and serve. Sally! Wow what a feast. My wife is not much of a meat eater and when she was away last week I made the Primal Pork Explosion. I replaced the raisins for cranberries (not a raisin fan). The boys came over for a pork and poker night and they have invited themselves for dinner this week, it was that good. Yum! That stuffing does sound good with pork. That loin must have taken some muscle to flatten. I’ve had good success with cutting one in half, and then flattening it into a sheet before. Either way, I’m drooling on your basket weaved bacon. Thanks for the recipe!